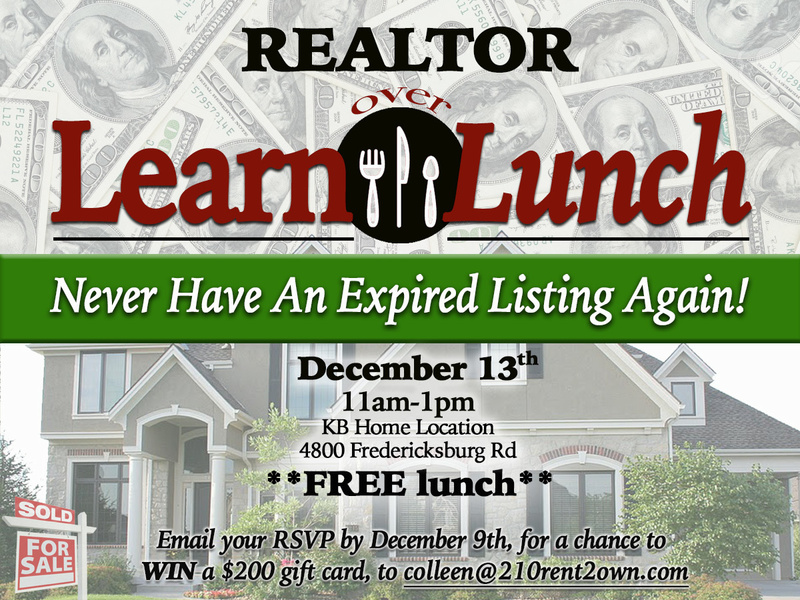 This is Joe Padilla from 210rent2own Just wanted to give all you realtors a shout out and let you know that we are having a luncheon just for you! We are going to cover a lot of topics, but the biggest and most general thing we are going to talk about, is how to make YOU money! And how to make money quicker. We will be covering things like tough listings, listings that don't sell, how every buyer that gives you a call can make you money, whether their qualified or not. How to think like an investor, in order to sell to investors. Different types of financing that might not be available to you, like subprime or investor financing that you can help your owner occupied clients in order to get a home. And so much more! at the KB Home Office, located at 4800 Fredericksburg Rd. FREE LUNCH will be provided. Catered by the best Italian food in town, Guillermo's Italian. RSVP by December 9th to WIN a $200 visa gift card and to reserve your seat. To RSVP click here or go to our facebook.com/rent2own.com or simply email your RSVP to [email protected]. DON'T FORGET TO REGISTER YOUR GUESTS TOO!